The subject of posture is a big one, especially for Chiropractors these days. Although in my office, I see many patients for many different types of complaints, a significant portion can be directly attributed to not only poor posture in general, but specifically a forward head posture. Just walk into any coffee shop and you will see people lovingly gazing with their bloodshot eyes into the glare of their laptop screens, with a slumped forward posture. Laptops are the worst contributors to poor posture as they simply cannot accommodate a proper ergonomic position. It is quite common for people to spend as much as 10-12 hours per days in front of their computers. Add in the time on their smart phones surfing, driving, and sitting on their couch and we have an epidemic of poor neck posture. Can Posture Affect Your Breathing? Rene Cailliet M.D., famous medical author and former director of the department of physical medicine and rehabilitation at the University of Southern California states that forward head posture (FHP) may result in the loss of 30% of vital lung capacity. Poor posture invites distorted, restricted, shallow breathing. Just try this: sit down and bend over and try to breathe in. Notice how it is harder to breathe. This is an extreme example of how our muscles and tendons get over restricted and cause a lessening of depth and ease in breathing. This also restricts your esophagus, phrenic nerves, aorta, trachea, brachiocephalic vein, but most importantly – breathing volume and ease. Poor posture can shorten muscles, ligaments and create stiffness in joints and alter nerve function, which are all required for normal breathing. Your ability to take a full deep breathe can affect your performance in sports, your mental clarity, your sleep, your attitude, your digestion and organ function to name a few. 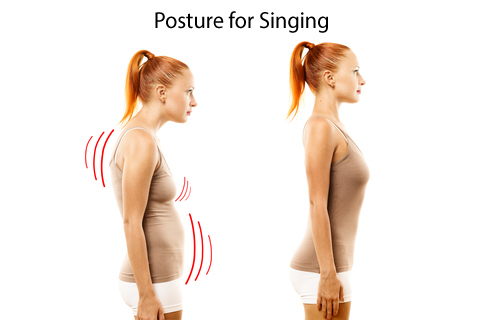 Have you ever noticed a singer’s posture? In order to hold those long notes, it requires very good posture for optimum lung function! How Can I Breathe Easier? Simply making yourself sit up straight or correct your posture is no easy task. In fact, forcing yourself can actually make it more difficult to breathe since your are fighting against all those shortened muscles and ligaments that have adapted over time to your poor posture. That’s why it can be difficult or uncomfortable to maintain good posture at first. Chiropractic care can help to ease the tension of these tissues and joints, making it easier to maintain and correct poor posture. However, good results take time. Certain types of yoga and Pilates can help to improve your posture. Yoga training also emphasizes healthy breathing habits. I suggest that everyone start with a chiropractic check up to identify any areas of concern in your spine before starting yoga to make sure it is safe for you. Sometimes certain movements may not be good for you if certain problems are found. If you feel that you cannot take a deep breath in, or feel that your posture can use some tuning up, schedule a chiropractic check up. We will examine your spine, and let you know how to best proceed so that you can be your healthiest YOU!